The benefits of hill running are tremendous. You'll improve your leg muscle strength, build fitness, boost mental toughness, and engage your leg, arm, and core muscles in different ways. Running hills can also be a great boredom-buster for runners who are looking to shake up their routine. Whether you're training for a 5K or a marathon, these hill workouts can help you achieve all those benefits as well as improve your uphill and downhill running skills. They may even make you look forward to tackling the hills come race day. Before you start, it's a good idea to review how to run hills properly, so your running form will bring you the most benefits. These repeats are excellent for building stamina and are especially beneficial for those training for a race with lots of rolling hills. How to do it: Find a half-mile long hill with an about 5- to 8-percent grade. 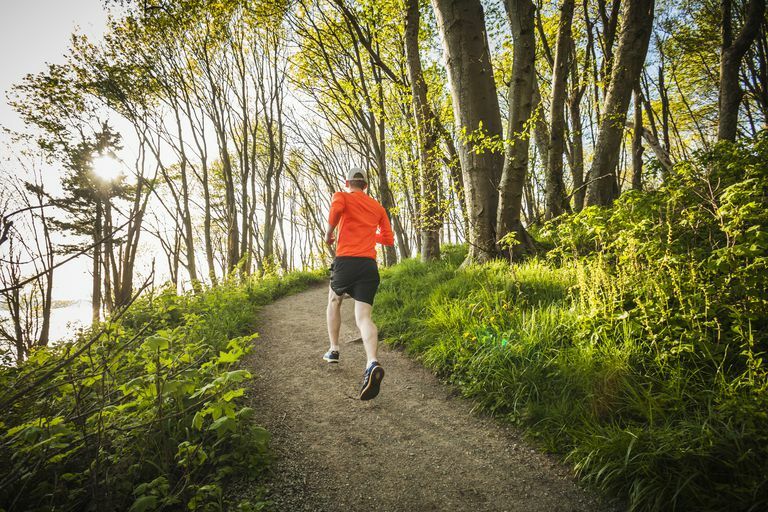 Run uphill at 5K effort and recover at an easy pace going back downhill. Repeat 5 to 6 times. Tempo runs are done at a "comfortably hard" pace or an effort level you can sustain for around 40 minutes. How to do it: For tempo run hills, do a 5- to 10-minute warm-up of easy running and then find a gradual slope. Run uphill for one minute at your tempo pace, then turn around and run down at the same effort level (keep in mind that the same effort on the downhill will translate into a faster pace). Aim to repeat the uphill/downhill 10 to 20 times, depending on your experience with tempo runs and hills. If you've done plenty of tempo runs and hill repeats, you can stick to the higher end of the scale. If you're new to hills, stick to the lower end and do easy pace on the downhill for one or two of the repeats, to give yourself a chance to recover. These repeats are great for improving your stamina and mental toughness to push through fatigue, especially towards the end of a race. How to do it: Find a hill that's about 200 to 400 meters. Start the uphill at race pace effort (for whatever race you're training for) and then push to a hard effort for the last 50 meters of the hill. Focus on pumping your arms harder and lengthening your stride as you push to the top of the hill. Recover at an easy pace on the way down. Do 5 to 8 repeats. These hills can help improve your strength, speed, running form, and overall power. They're good for middle-distance track and cross-country runners, as well as anyone looking to improve their 5K or 10K times. How to do it: Choose a short hill with an average gradient. You should run the uphill at a hard effort—85 to 90 percent of your maximum heart rate. Exaggerate your arm swing movement, with your arms pumping hard and high. Focus on pushing off from the ball of your foot. Recover by walking or jogging the downhill. Do 6 to 10 repeats. These repeats are the same as the Short Speed Hill Repeats above, except that you push the downhill and recover on the uphill. Do 6 to 10 repeats. These repeats are an excellent way to feel and practice the pace changes you'll experience when running hills in a race. After running up a hill, rather than turning around and going back down, you'll continue at the same effort level (as you would during a race). How to do it: Find a hill that flattens out for a bit once you reach the top. Run at your 5K effort from the bottom. Once you reach the top of the hill, continue running at the same effort and observe how your speed picks up. Run for another minute at that effort, and turn around and recover going downhill. Do 4 to 6 repeats. Although all of the above workouts were intended for outside running, most of them—with the exception of the Short Downhill Speed Repeats—can be done on the treadmill. When a workout calls for downhill recovery, just recover at a 0 incline.